The battery compartment features a large, securely latching door. 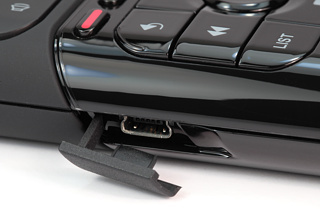 A small captive rubber cover on the left side immediately above the compartment conceals a Mini USB port, used for PC communications. Two small metal contacts near the bottom of the remote connect with the recharging station to provide power, while a tiny hole in the case about one-third of the way from the top is for a speaker. Both ends of the Xsight are made of transparent plastic panels that conceal infrared eyes – two emitters on top, and a solitary IR learner on the bottom. From an appearance standpoint the Xsight Touch is several notches above other recent releases. Sleek, smooth, glossy, unique button shapes, symmetrical design, blue key backlighting – it’s everything that a modern and expensive-looking universal remote control should be. The Xsight is well balanced, with the center point just slightly lower than midpoint, directly behind the [Volume Down] button. A small indent on the back in the matte painted area can be used to rest your index finger, although I found its position about an inch too low for the remote’s weight distribution. With the number of complex devices fast becoming everyday appliances in the average family’s entertainment system, it can be a significant challenge to design a remote that has every button needed by a majority of users without ending up with something two feet tall. Despite its average size and the inclusion of an LCD touchscreen, the Xsight engineers have managed to cram in nearly every hard button that would be needed for daily use, right down to the 4 color buttons used by European equipment owners and a growing number of North American devices such as Blu-ray players. They’ll even be useful for Scientific Atlanta cable boxes with their infamously inconvenient A/B/C buttons. The command selection is certainly good, but the demands of placing all those keys on the Xsight’s normal-sized housing have resulted in a layout that could be considered somewhat cramped. On one hand there’s the 9-key transport cluster: a good design that’s both logical and well spaced, with a large circular [Pause] button in the center and other functions radiating outwards in 8 directions. And then there’s the combination volume, channel and cursor controls, which occupies the same amount of space but attempts to wedge in a further 2 buttons while simultaneously placing circular controls in a rectangular space. The end result is a directional ring that’s just a little too small, large volume and channel toggles that waste valuable space above and below the directional ring, and inset [Mute] and [Jump] buttons that make the otherwise large toggles feel claustrophobic. While it’s still usable and certainly looks nice, the concept ideally needed more width. Finally there are those three horizontal rows of four buttons: these keys are positively tiny, and unfortunately, most of them represent important functions. Bundled with the Xsight Touch is a docking station used to recharge the Lithium Ion battery. 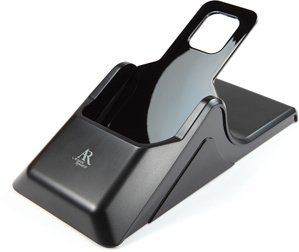 It measures 6.5” long and 3.08” wide (16.5 by 7.8cm), and holds the remote at an approximate 30 degree angle so that it can be used while docked. The remote slides about an inch into the station when docking, and must be removed using a similar motion. As the remote’s fit in the station is snug and my tendency is to want to pull the remote up and towards me when undocking, rather than sliding it away from me as the design requires, I’ve found that the lightweight station tends to slide around the tabletop and requires the use of a second hand to hold it down. The station does have rubber feet to help counter this behavior, however on our sample unit the center of the station’s bottom bulged out just enough that the four small feet were unable to make secure contact with the table surface.